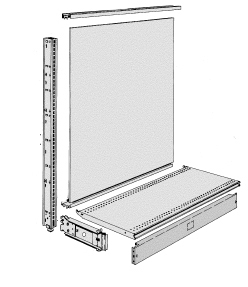 The wall shelving also known as Single Sided Wall Gondolas are designed to be placed up against a wall to provide support for the side of the Gondola that does not have a base for support. All Gondolas are configured using the same components known as: a Basic Upright, Base Shoes, Base Shelves, Spanners, Backboards, Kick Plates and, Base Shoe Covers with the Upper Shelves sold separately. what makes them interchangeable is the Basic Upright is configured with slots on both sides. This allows the ability to hang Base Shoes and Upper Shelves on both sided of the shelving system. 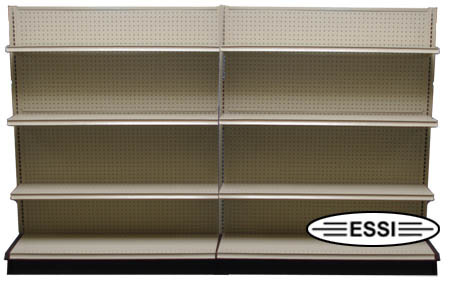 Gondola Shelves area available in either a 24" wide, 36" wide, or a 48" wide sections allowing the ability to meet the need of most any retail store applications. Available in many styles and colors for all types of high end stores. What is the difference between a Wall Section and a Wall End? If you will notice via the illustrations below the Wall Section includes everything except the second Wall End as only one Wall End is needed per Wall Section when creating a multi section Gondola Aisle. To complete the Wall Aisle a Wall End is Necessary. To create a Wall Aisle of shelving you will start with one section pictured below and add the second and third section to the first and second sections. As you add the second section to the first section, the first end of the second section will complete the first section of shelving. When you add the third section to the second section that will complete the second section. So one end is needed to complete an aisle of shelving. 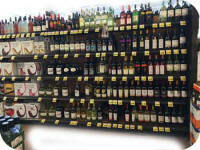 A Wall End is used to complete a Wall Aisle of shelving. For example a 16' Wall Aisle will consist of 4 Gondola Sections and 1 Wall End to complete the Aisle. The image on the left shows a all the components for one section. A basic upright and 2 base shoes used to create one end, a back, base shelf, upper, center, and lower spanners, front kick plate, base shore covers and an upright cover. Available heights up to 10' high and above by special order. Lengths can be from 2' long to as longs as needed up to 40' and beyond.